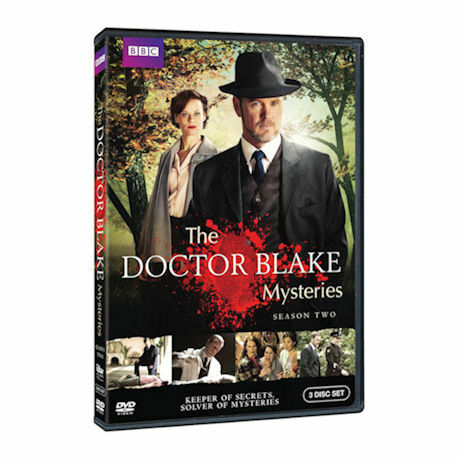 Doctor Lucien Blake returns to Ballarat after an attempt to reunite with his long lost daughter. But it's no longer the safe haven he left behind. There are the strange and baffling murders that come his way, there are mysteries seeping out of every corner from political corridors and church vestries, to, art galleries and rock 'n' roll halls. Blake returns to Ballarat to find the newly elected Mayor lying dead at the bottom of the steps of the Town Hall. Doctor Blake must unravel the mystery of the death of an up-and-coming rock'n'roll star, after he collapses into the arms of his fans at a sell out performance. The body of a well-dressed man is found dead on a picnic blanket in Ballarat's botanical gardens. He has been lying there for 24 hours unnoticed by the Sunday afternoon revellers in the Park. So begins one of Blake's most intriguing investigations. When a body plunges from the Colonists' Club onto the street below, Blake is thrown into a case that takes him far beyond an accident or even a possible suicide. Cinemagoers hurry to safety after a fire breaks out in the projection booth. The projectionist has been burned to death and every employee and patron in the cinema is a suspect. A local funeral takes a macabre twist when a second body is found in a coffin just before it's about to be buried. It turns out to be the body of a local man - but why would someone kill him, and then go to such elaborate measures to get rid of the body? When a Ballarat school Principal is found dead Blake and Lawson go back to their old school. Why has this man of standing been killed? Well, it would appear that there are more than a few women folk in the town that wouldn't be sorry to see him gone. The murder of an artists' model draws Blake into the art world, taking him on a journey of self-discovery as he uncovers a secret about his beloved mother. When beloved Father Morton is found dead in the confessional booth, Blake concludes his death was no accident. As he investigates which of the parishioners might have motive to kill their own priest, Blake is forced to examine his own beliefs in the Almighty.